Dimensions: 140x60x72cm high. Inside dimensions: 108x40x27. 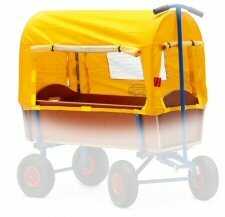 This large Beach Wagon is easy to dismantle and can be taken with you to the beach, camping or a picnic in the woods. The wood is weather-proofed. Weight 32Kg. Max Load 100Kg. 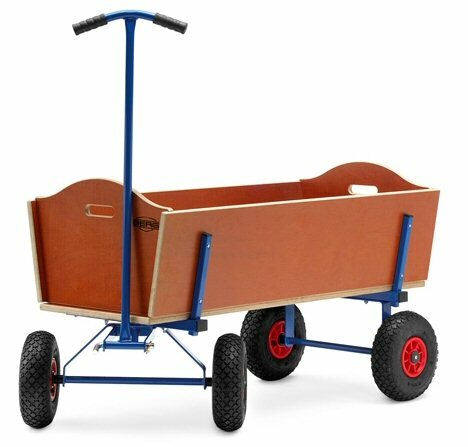 Berg Toys, the leading European manufacturer of heavy-duty pedal Go-Karts, is based in Holland. Each Berg Car comes with a sound guarantee: 5 years on the chassis, and 2 years on all remaining parts against defects in manufacture (the Compact range has 1 year on all remaining parts). All our Berg Cars & Accessories carry both the CE and TUV quality mark. We provide a full spare parts service, so can have peace of mind, knowing you'll be able to keep your car going for many, many years to come.